Wondered where I was, getting lonely? Traveling has it’s challenges and finding good connections to the internet isn’t easy. I enjoyed going across the country via the Trans-Canada Highway for the first time. We left home in Boise, Idaho, on a sunny day, traversed mountains and valleys where the rain and cold started. When we traversed into Canada I felt my feet planted firmly home. This is our first experience RV’ing, and it has its own challenges. Gas, electricity, battery, hooked up or not... What to do when parking the first night... What’s the last step before departing in the morning? We did not see the sun often on this trip. It’s been pouring rain almost every day. The countryside is amazing, and each province has its own beauty. The second morning we woke up to the views of the fog-filled mountains in British Columbia. It was cold and damp. I collected enough manhole covers throughout the province to create the first volume of BC. I would love to make a trip to Vancouver to place it on my map of City Shields. The week before my departure, I communicated with the City of Calgary to find the location of the “Chinook” designed manhole cover. Randy Niessen at the Public Art Program in Calgary gave me streets and intersections where I could find the manhole covers I was looking for. I visited the office of Ivan Ostapenko, an architect who is designing a new manhole cover for the City of Calgary. While walking the grounds of the Calgary Stampede, a security attendant gave me a golf cart ride to find the manhole cover I was so excited to find. He drove me around till we found the rodeo cowboy! What a day! In Saskatchewan we were plagued with mosquitoes! I visited Cathryn Miller’s studio. © 2016 Louise Levergneux in Cathryn's studio, love the equipment! Cathryn is the only professional artists’ book maker in Saskatoon. Cathryn and her husband David were generous with their time and stories. This was a fantastic visit. We talked about artists’ books, our past, our work, and where we have lived. Cathryn gifted me her Thank Your Lucky Stars multiple which I have been admiring from afar. © 2016 Louise Levergneux, Cathryn has folder over 60,000 of these wonderful stars over the past 3 years. Her studio had three bins of these wonderful stars. I always wondered why Cathryn had recipes as part of her blog posts. The reason is the biggest vegetable garden I have ever seen. 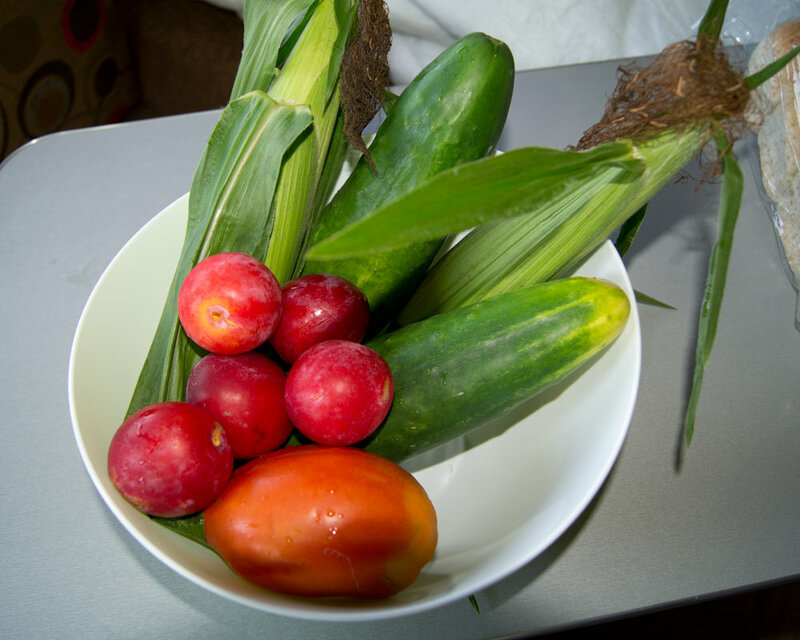 They shared tomatoes, cucumbers, corn and the juiciest plums, yum! We dry camped on their 19 acres of land, it was the best night sleep of the whole trip. The last morning we drive through Saskatoon and found approximetly 28 manhole covers. One more volume to the series. © 2016 Louise Levergneux, Cathryn's vegetables and plums were delicious! Manitoba produced flatness, more rain and lightning. The rain lifted enough for me to run out of the car street after street to photograph more manhole covers. The Incessant Journey continues throughout Ontario! It’s humid! I had forgotten how humid Ontario gets in August when the rain starts. We don’t have monsoons but we have a wave of humidity. Topaz fluffed up like a fur ball. Home and camera full of wonderful photos of new manhole covers. Now the work begins again. I will take a few weeks to visit with friends and family. My posts might be erratic but will communicate my journey. Enjoy your week. What’s your story? Where do you come from? Where are you going? Who has helped you find something lately?